M T D F e b r u a r y 2 0 1 9 18 Relevant statistics from an industry in constant motion Numbers ThatCount $15.4 billion Amount U.S. drivers paid in rust repairs caused by de-icing methods over the last five years, or approximately $3 billion annually. Brake lines, fuel tanks and exhaust systems oen took the hits. 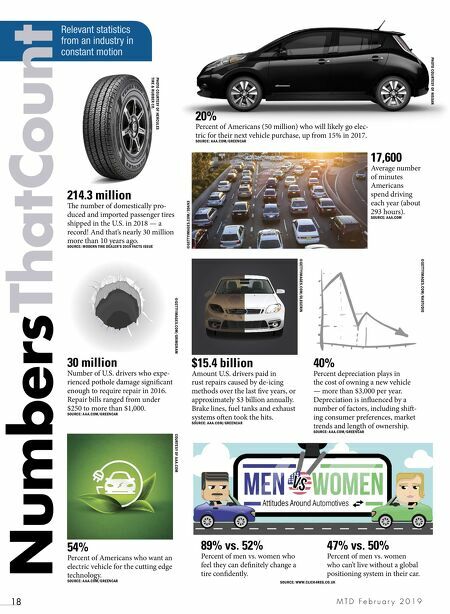 SOURCE: AAA.COM/GREENCAR 17,600 Average number of minutes Americans spend driving each year (about 293 hours). SOURCE: AAA.COM 30 million Number of U.S. drivers who expe- rienced pothole damage significant enough to require repair in 2016. Repair bills ranged from under $250 to more than $1,000. 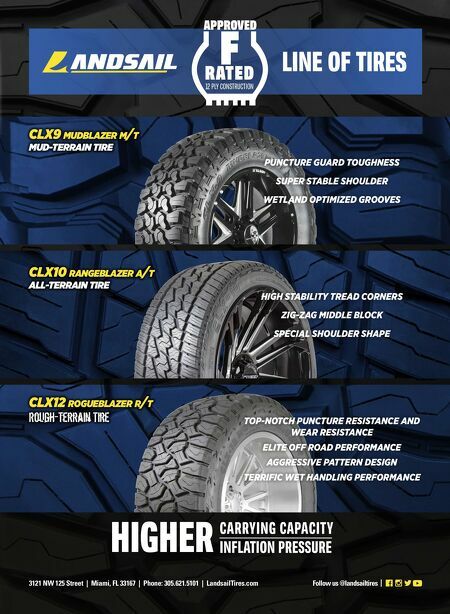 SOURCE: AAA.COM/GREENCAR 214.3 million e number of domestically pro- duced and imported passenger tires shipped in the U.S. in 2018 — a record! And that's nearly 30 million more than 10 years ago. SOURCE: MODERN TIRE DEALER'S 2019 FACTS ISSUE 54% Percent of Americans who want an electric vehicle for the cutting edge technology. SOURCE: AAA.COM/GREENCAR 89% vs. 52% Percent of men vs. women who feel they can definitely change a tire confidently. 47% vs. 50% Percent of men vs. women who can't live without a global positioning system in their car. 40% Percent depreciation plays in the cost of owning a new vehicle — more than $3,000 per year. Depreciation is influenced by a number of factors, including shi- ing consumer preferences, market trends and length of ownership. SOURCE: AAA.COM/GREENCAR ©GETT YIMAGES.COM/OLEGERIN ©GETT YIMAGES.COM/GRIMGRAM COURTESY OF AAA.COM ©GETT YIMAGES.COM/RASTUDIO PHOTO COURTESY OF NISSAN ©GETT YIMAGES.COM/3DAN3 SOURCE: WWW.CLICK4REG.CO.UK 20% Percent of Americans (50 million) who will likely go elec- tric for their next vehicle purchase, up from 15% in 2017. SOURCE: AAA.COM/GREENCAR PHOTO COURTESY OF HERCULES TIRE & RUBBER CO.